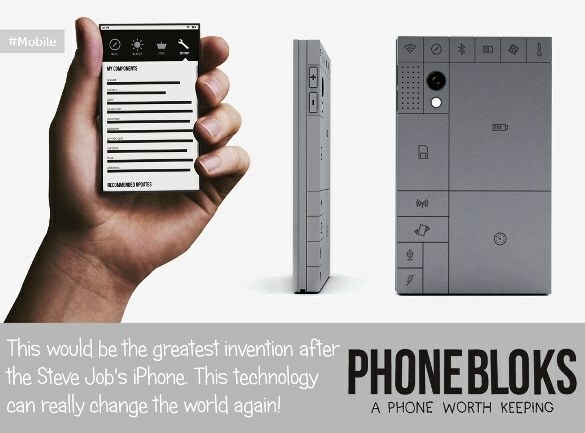 A New Smartphone that'll change the world - PHONEBLOKS. Imagine a mobile device whose parts like WiFi, Bluetooth, Camera, Battery, Processor can be detachable and can be upgradable as per your daily day requirements. It is a smartphone with swappable components. Amazing! isn't that? You are going to get excited to know about a new smartphone concept called Phonebloks. It is the smartphone that will be there for the rest of your life and A phone worth keeping eco-friendly mobile handset. Learn what's going new on mobile technology. I would like to say, this would be the greatest invention after the Steve Job's iPhone. This technology can really gonna change the world again. There is no need to throw entire mobile phone if one of its parts get damaged, you just need to change that part easily, that's Phonebloks concept [Upgradable Modular Smartphone]. Motorola Unveils DIY Smartphone Project With Phonebloks and publicly announced Project Ara & Phonebloks Prototype [a new modular phone concept] on October 29, 2013. Get more information about Phonebloks Prototype. Every year millions of mobile phones are thrown away because they are broken or obsolete. In most of these cases it is just one part that needs repairing or upgrading and all the other parts work fine. However, the entire phone will be thrown out because of one reason: mobile phones are not designed for repairs or upgrades. This mobile phone exists of separate components that can be ‘clicked’ together. Every component has its own function i.e. Bluetooth, WiFi, battery, display etc. When one of these components does not work, it can be replaced with a new one. When one of these components needs upgrading, same story: replace that specific component with a new one. Choosing separate components enables you to personalize your mobile phone to your needs. Are you into taking photos? Go for the best camera. Are you working in the ‘cloud’? Choose less storage. No need for a specific function? Go back to basic and choose a top notch battery. Show the world there is a need for a phone worth keeping, the more people we gather, the bigger the impact! Companies work together to build powerful desktop PC (CPU, GPU,﻿ RAM etc.) so why they can not work together to build a phone? Phonebloks is revolutionizing the smartphone industry with an outrageous, yet awesome idea. Imagine a phone you can upgrade and customize at will. You would never need to purchase another phone! It would like to say that this is one of the biggest evolutions since the beginning of industrial revolution in mobile technology. This is really amazing! The big companies will use their influence to prevent this from taking off.﻿ Why would they support innovative ideas if it doesn't benefit them or suite their business practices? Companies who refuse to join/copy this idea, will go bust. Phonebloks will be the biggest company on earth within 10 years. All electronic equipment will be made this way. Think about the endless possibilities... camera's, tablets, laptops, etc..
Getting components separately will be more expensive than an all-inclusive package. The blocks seem to have sharp edges, making it uncomfortable to hold (I guess you could use a case and make it even thicker.